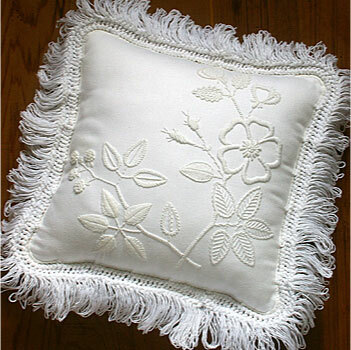 This Mountmellick Dogrose and blackberry cushion features a small branch each of dogrose and blackberry. It is a sister pattern for our Wildflower Cushion. They would look great as a set or by themselves. With a wide range of stitches, you'll enjoy the variety in stitching this cushion. To complete the kit you will need to provide your own 35 cm (14 in) cushion insert and 30 cm (12 in) white zip.